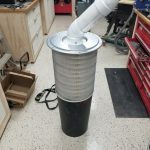 Fan/Motor: I repurposed a portable dust collector fan I’ve had for a while that’s been underutilized (collecting dust, but not as intended). 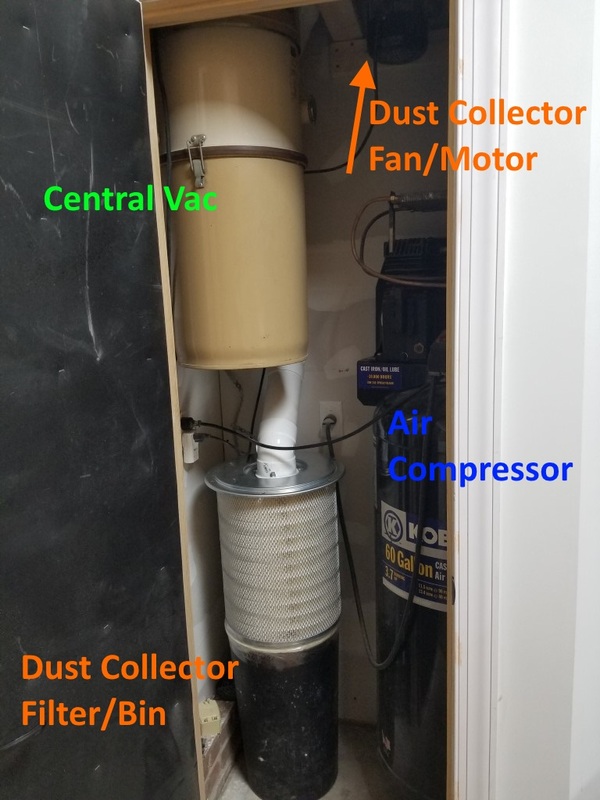 Space is limited in the mechanical room so since the fan won’t need easy access I mounted it high up above the air compressor near where the dust collector pipe enters the mechanical room. Pipes: 4″ PVC DWV pipes; there are a few branches leading to the different tools. 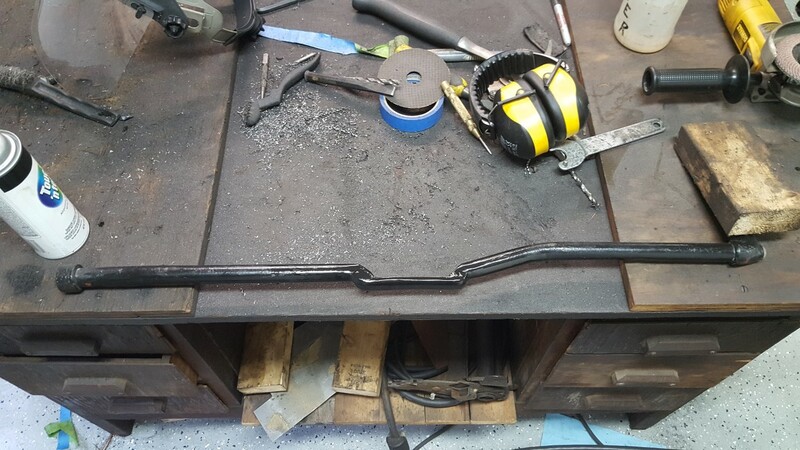 I tried to keep the overall length as short as possible and the bend radius’s large. Blast Gates: The blast gates control the air flow though the system by blocking off unused branches. 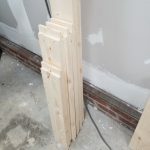 I made these with 1/2″ plywood and 1/4″ hardboard. 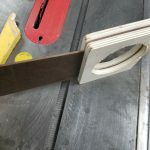 Circle cutouts were made on the lathe to match the pipe outside diameter exactly. 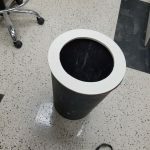 Filter and Collection Bin: The portable dust collector came with a light canvas bag that restricted the air flow massively while still allowing fine particles to escape. To improve this I replaced the bag with a semi truck air filter mounted to a trash can. 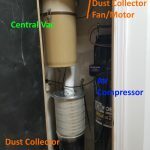 The theory is that air will exit the filter and larger dust/chips should fall into the trash can below. 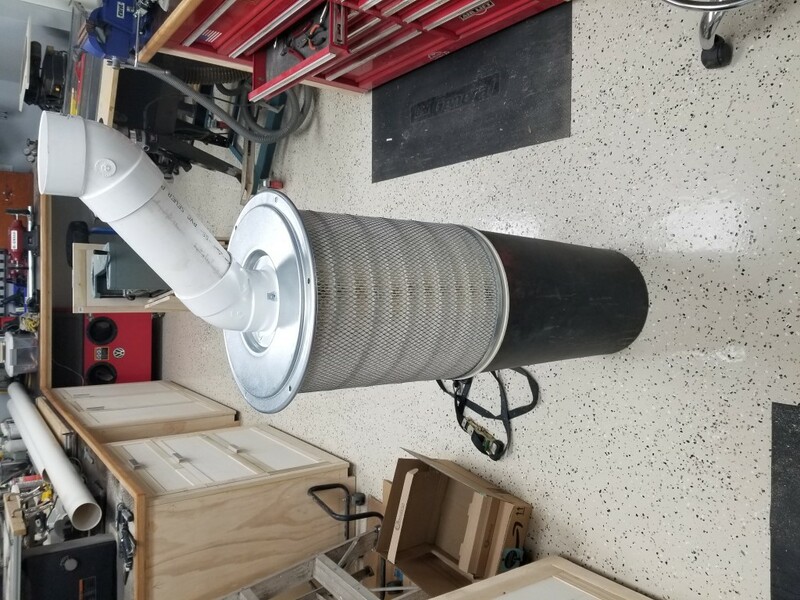 There are purpose-built dust collection filters available, but the costs are much higher for these and the semi truck filter has the same specs; different economies of scale. 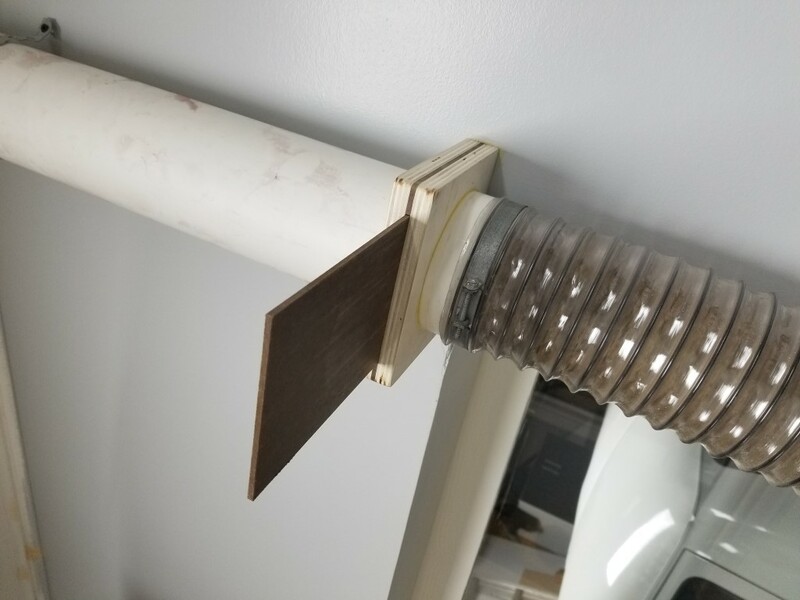 To mount the filter to the bin I made a plywood ring, for now they’re just taped together but I may add latches at some point. The design may need some tweaking; I’ll know more after it gets further use, but for now the airflow is excellent. 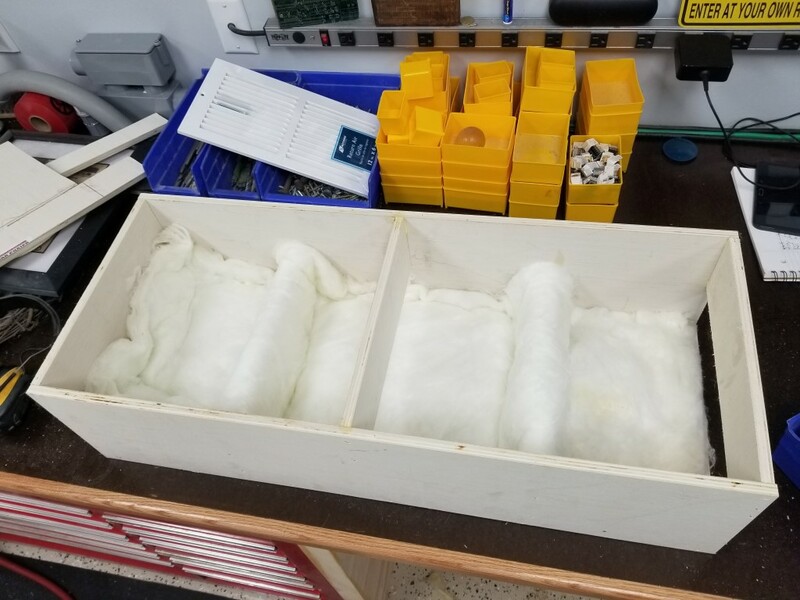 Return Vent: Having the collection bin in the mechanical room created a problem; the mechanical room is well sealed for noise reduction, so there was nowhere for the air exhausted from the filter to go. 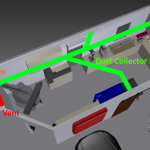 For heat/air to be retained in the shop, the exhaust air needed to return to the shop via a vent. 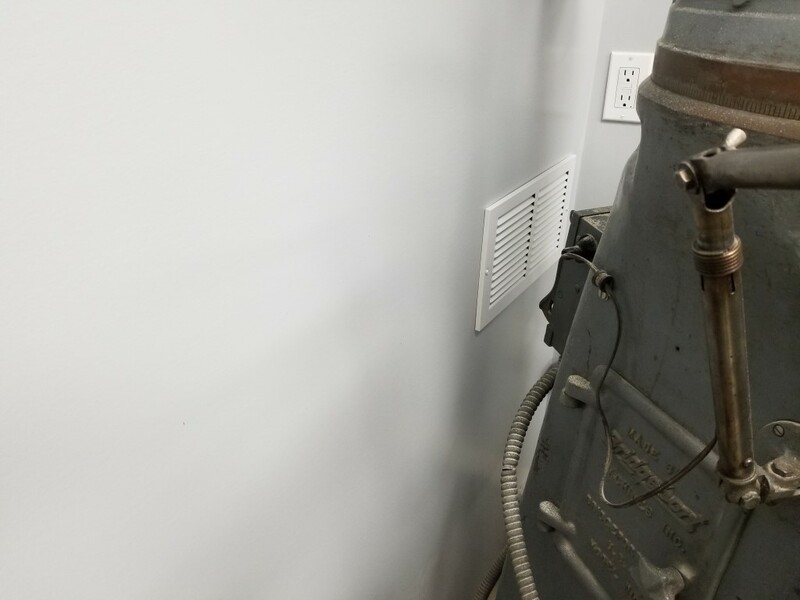 Since I also wanted to keep the mechanical room noise level as low as possible this meant the vent needed to be sound proof. 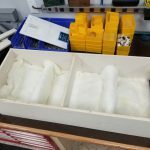 I built a sound proof vent by creating a 3ft long box and offsetting baffle plates inside of it. 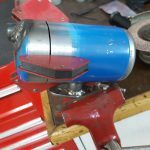 The sound has to reflect a dozen or more times off of the baffle plates; at each reflection it gets absorbed some by a fiberglass lining. The air, however, is able to snake around the baffles and find its way out. 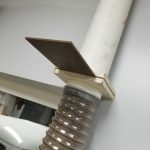 The inlet to this vent also points directly at the floor away from the sound sources. 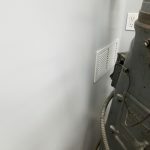 Somehow after adding this vent the mechanical room noise is actually noticeably quieter than when it was completely sealed. I think this may have had to do with the air pressure changes resonating in the previously sealed room, whereas now any fluctuations are equalized through the vent. 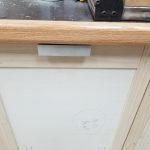 Control: For now control of the system is via a remote control outlet (repurposed from controlling the vacuum at the old shop), at some point I may integrate some low voltage switches with the blast gates so the motor will turn on as soon as any gate is opened. 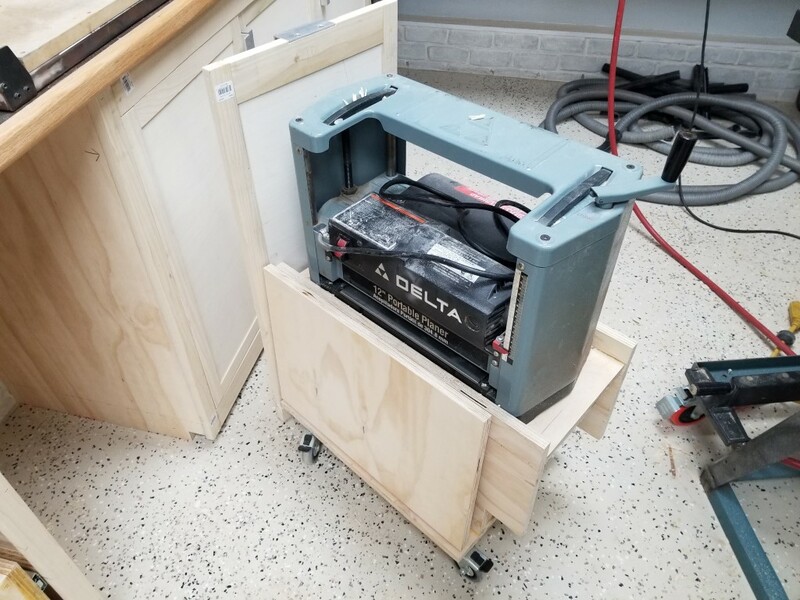 A while back I got an old Delta ‘Portable’ power planer at a garage sale; it’s helped out in a few projects already so I thought it deserved it’s own spot in the shop design. 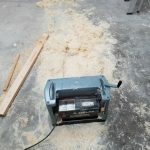 The planer requires a fair amount of space for it’s infeed and outfeed to keep the material flat, however the planer isn’t used enough to justify keeping it out on the workbench permanently. 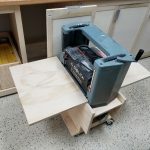 I also wanted to avoid the need to lift it out of a cabinet, so with this in mind I came up with the cart below that integrates with the cabinets. 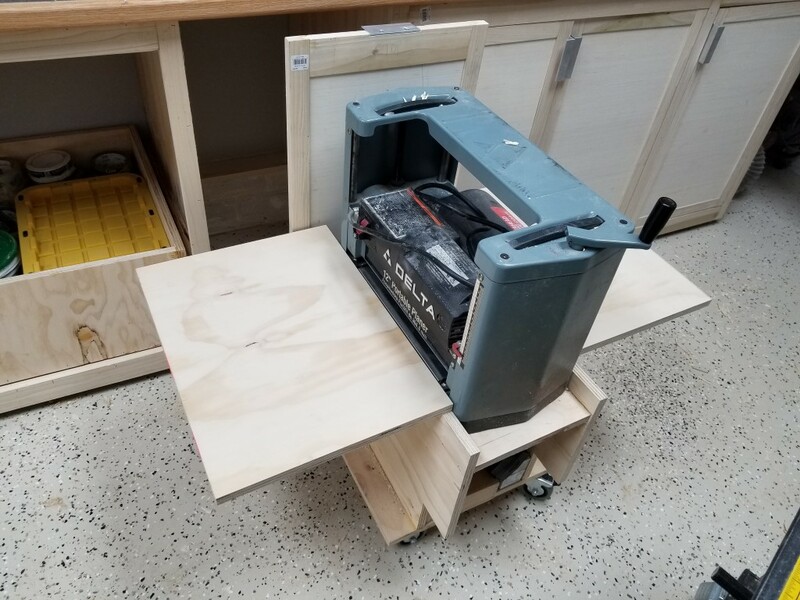 The cart rolls on double-locking casters and has folding infeed/outfeed tables that align with the planer’s table when upright. 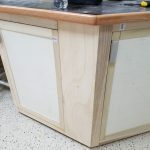 I used ‘drop leaf’ style hinges/supports to allow the tables to lock in place. 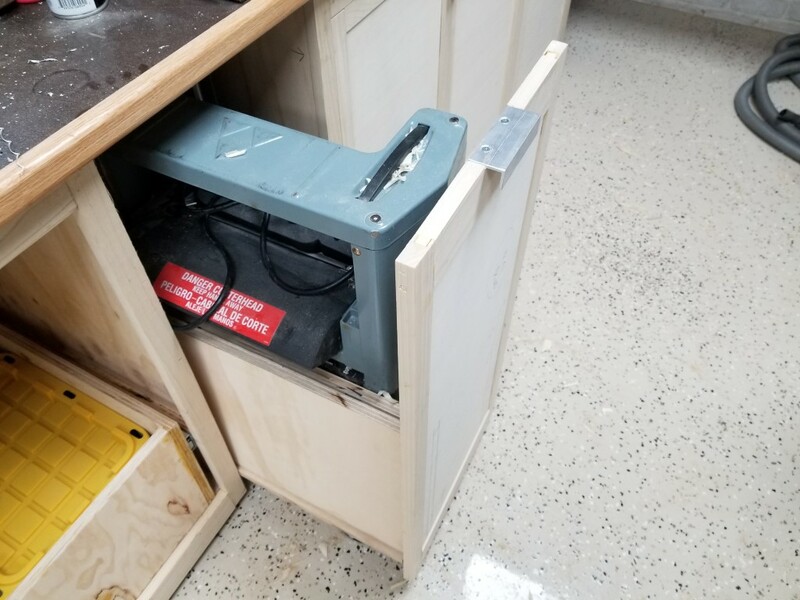 The ‘dead’ space inside is currently holding the router and router bits; I may convert this to a drawer at some point. 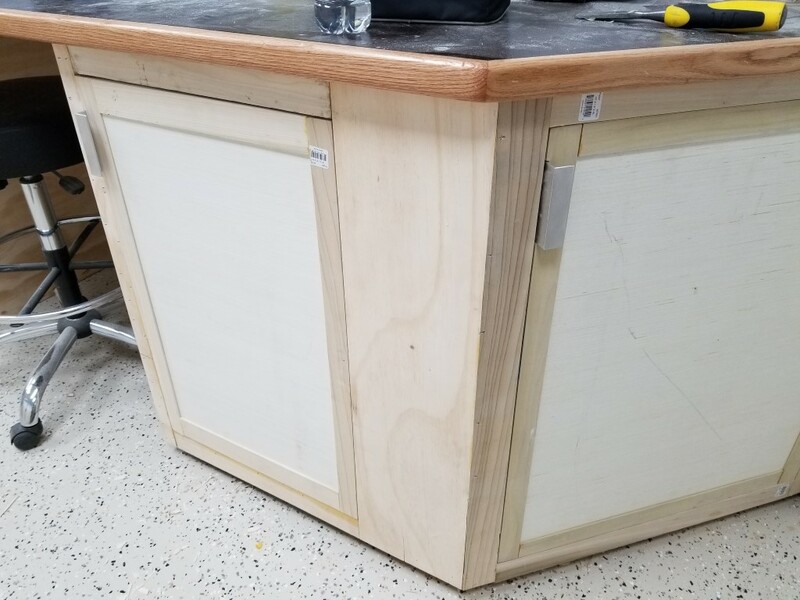 When the cart is stored it just looks like any ordinary cabinet door. 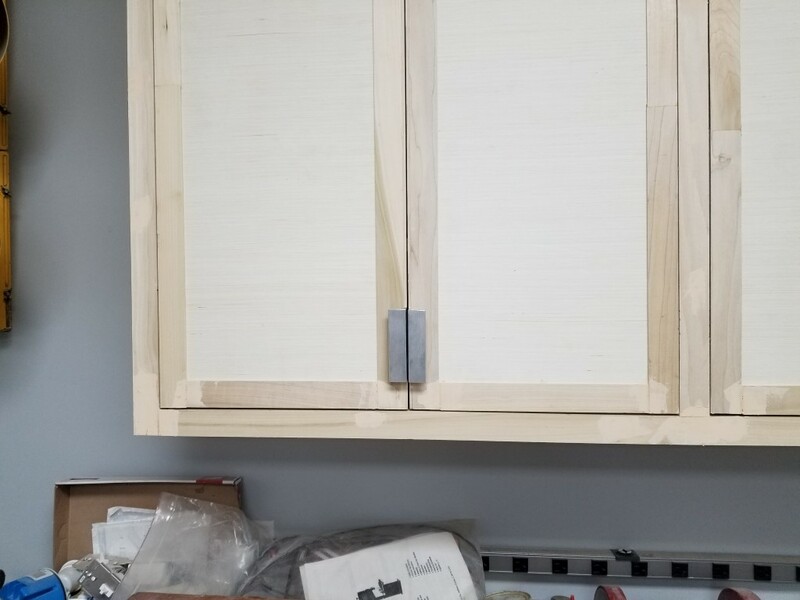 Over the last few nights I’ve been working on handles for the cabinets. 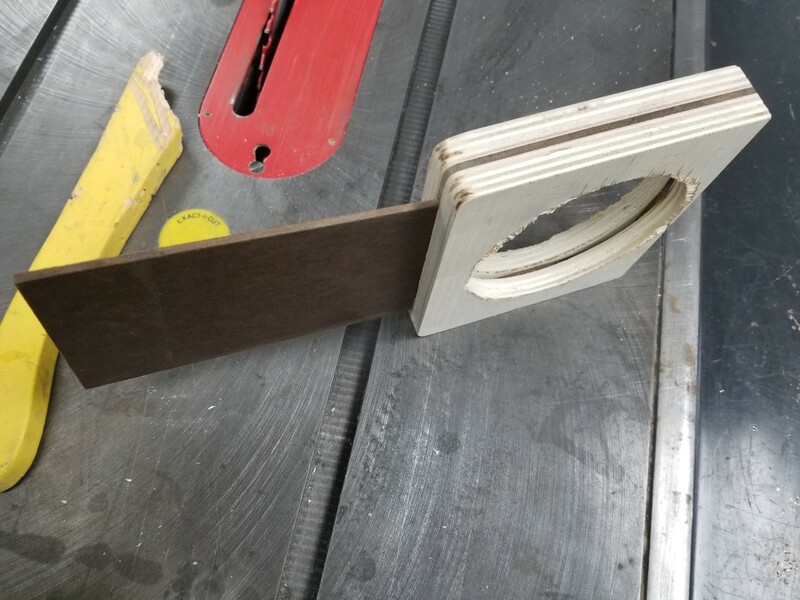 The handles are 4″ sections cut from 1.5″ aluminum angle. 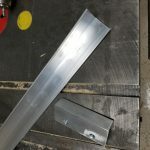 Before cutting to length I ripped ~1/2″ off of one side of the aluminum so the handles weren’t too wide. 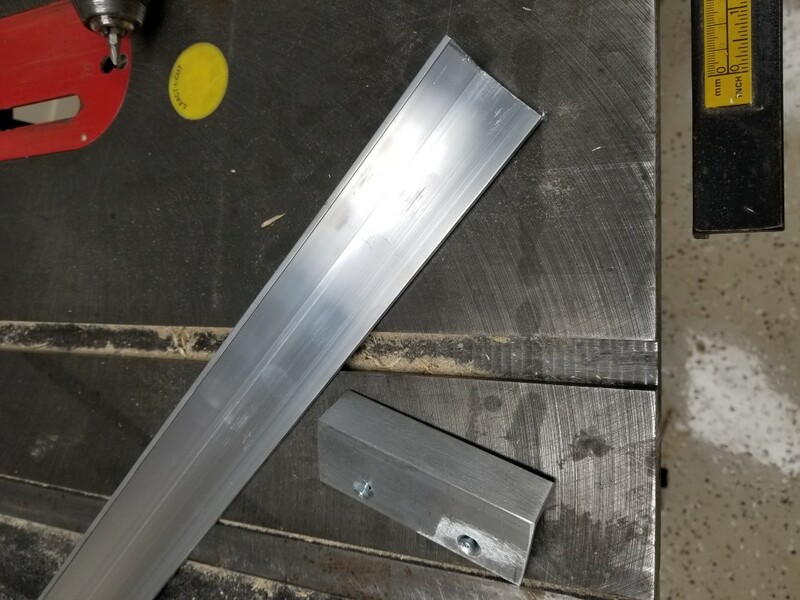 This was my first time cutting aluminum on the table saw, it was very quick and effective but also shot scalding hot aluminum chips in every direction and sounded like a Pterodactyl being fed through a wood chipper. 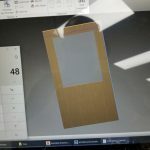 Since I may add/change cabinets in the future I wanted to make sure that I wasn’t locked into a particular brand/model of handle that could be discontinued, by making my own with standard materials this isn’t a problem and the cost was also kept to a bare minimum. 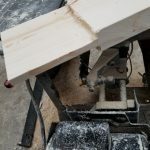 Once all the sections were cut to length I sanded the rough edges and drilled/countersunk holes on the drill press. 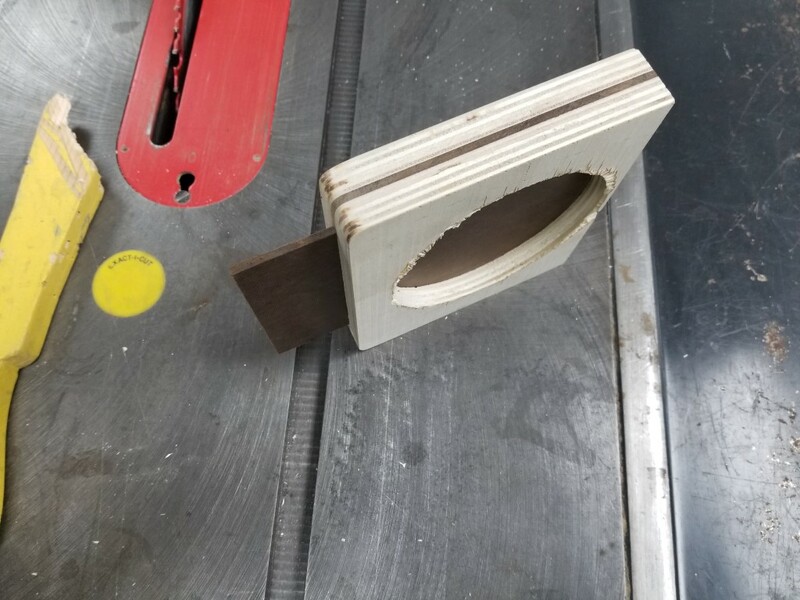 I made a quick fixture with clamps and wood blocks to get the holes consistently located. 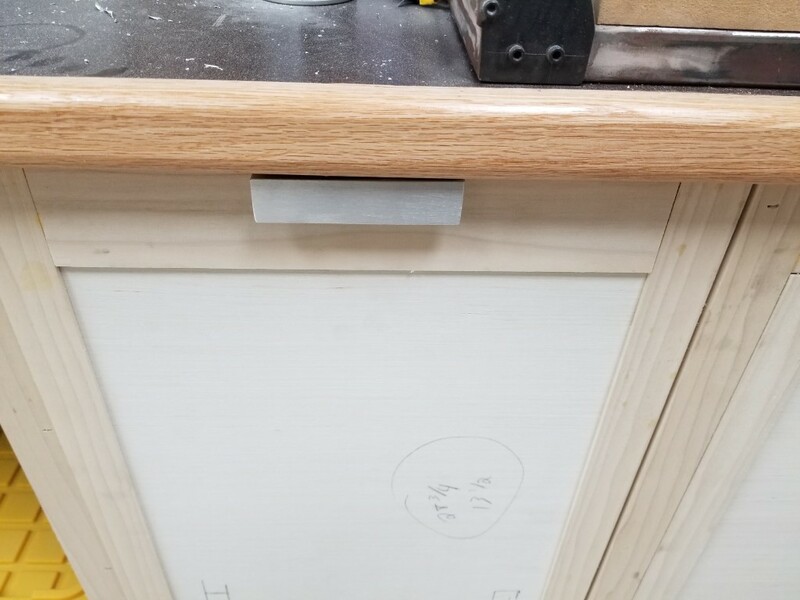 To attach the handles to the cabinets I chiseled out a 1/8″ recess and then attached the handles flush with the door edges. I’m undecided on whether these will keep their current ‘brushed’ looking finish or whether I’ll polish or paint them. 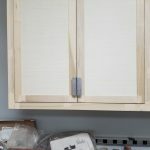 I’ll decide that when the time comes to finish/paint the cabinets. 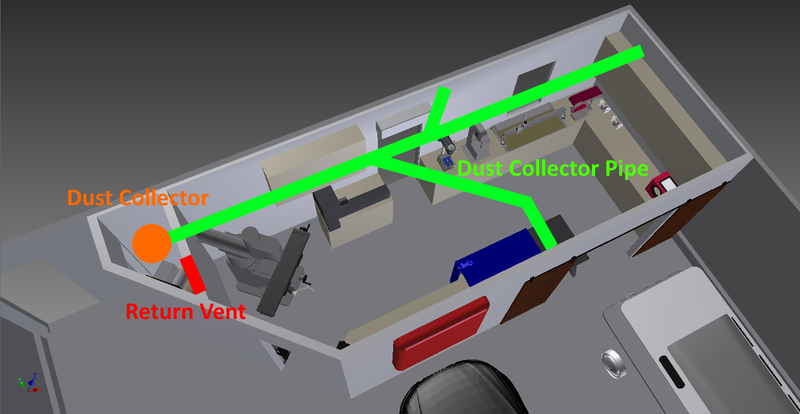 The shop floor plan allows for a large opening between the ‘far’ end of the shop and the auto repair/bus area. 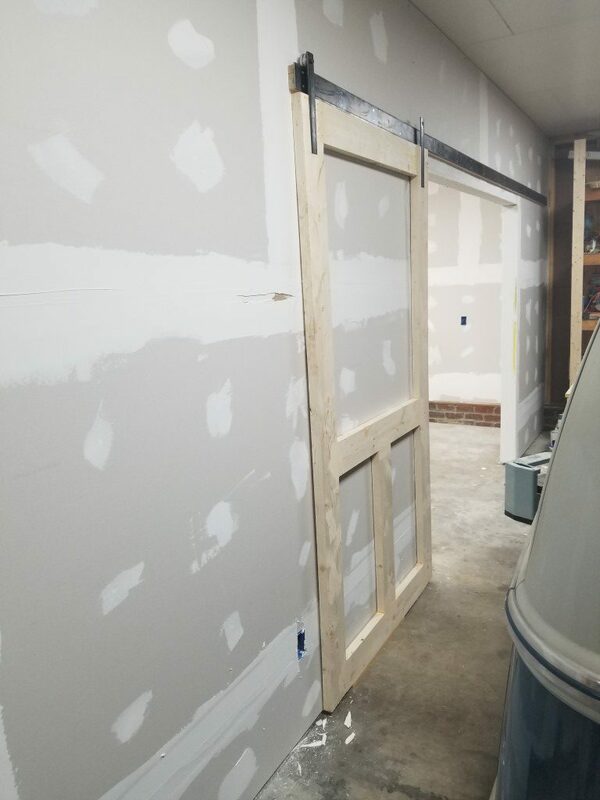 This will allow tools to be easily shared between both spaces; during a big auto project the repair bay can become an extension of the workshop. The opening is also big enough to bring in the front or rear of a vehicle if ever needed. 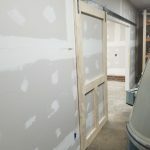 When auto projects aren’t underway though I’d like to have doors cover this opening to prevent dust/mess from wood/metal project leaving the shop area and to save on shop heating/cooling costs. 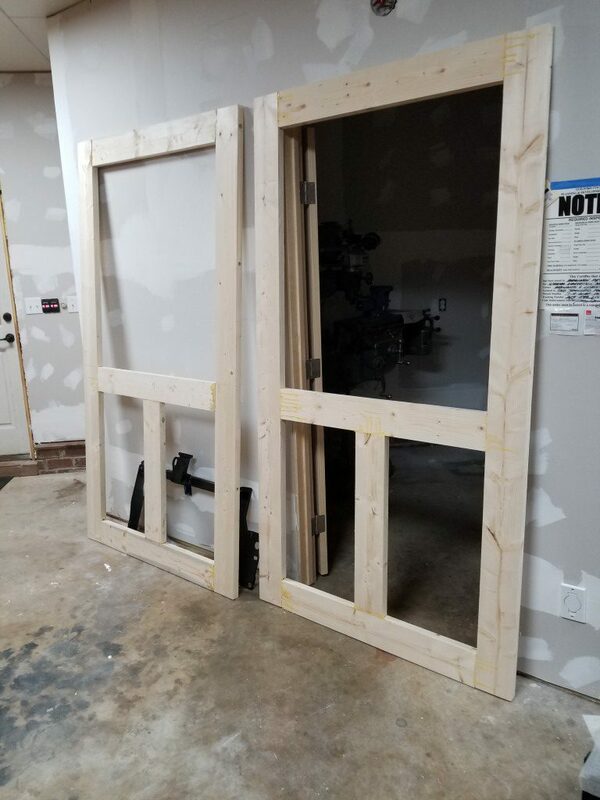 The size of the opening presents a problem – swinging doors would have to swing ‘out’ of the shop to avoid hitting cabinets, and the large sweep would require moving anything parked on the garage side out of the way temporarily, kind of a hassle. 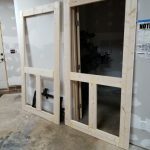 To avoid this problem, sliding doors made the most sense. 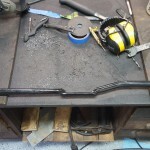 Slide rail is two 3/16″ x 3″ x 10′ flat bar sections welded in the middle. Door bracket pins turned and threaded on lathe then welded to brackets. 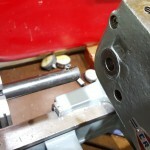 Aluminum rollers turned on the lathe, held to the brackets using standard 608 skate bearings. 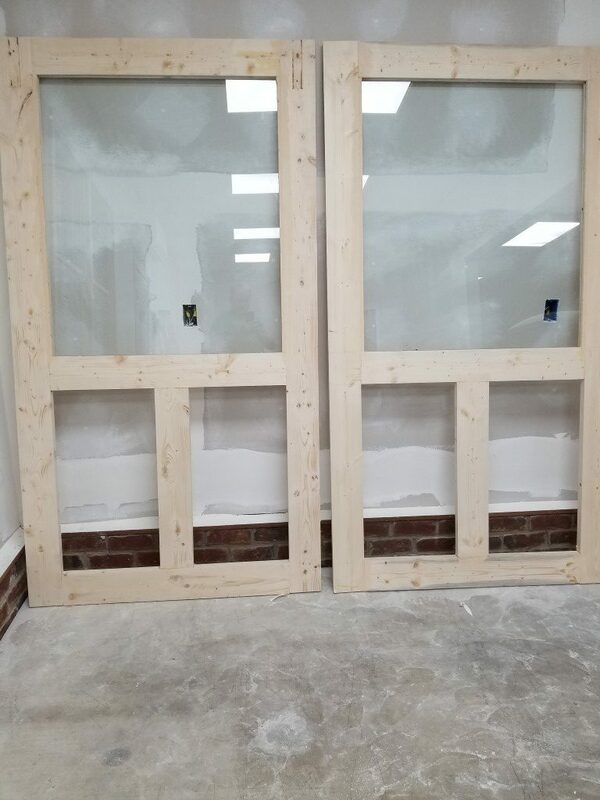 Brackets recessed into door frame and secured to the doors with studs welded to back side for a completely smooth front. 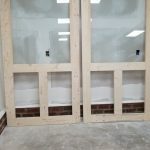 1/4″ Tempered glass sourced from local glass shop. Groove along bottom of door and small bottom bracket keep door located against the wall and limit inward overtravel. Roller to door top spacing and roller flange width prevent door from lifting/falling off rail. There’s a good bit of finishing work still left, but I’m happy with the results so far. 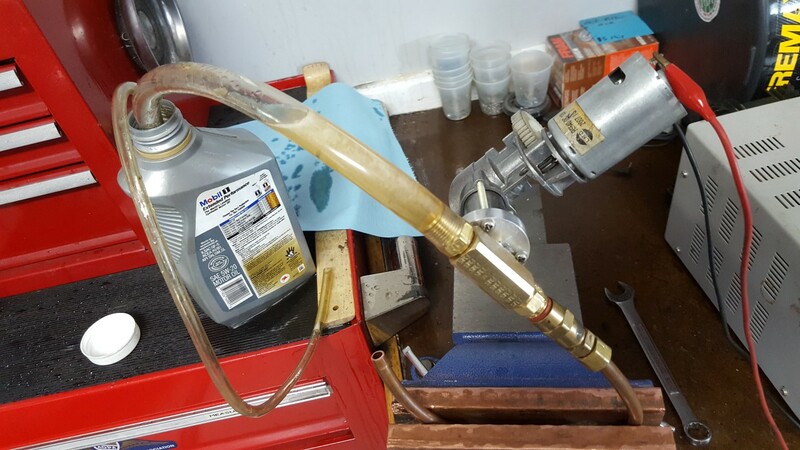 Tonight I tested the oil pump – it worked so well that the pressure blew off one of the plastic tubes I was using for testing and sneezed oil over everything. 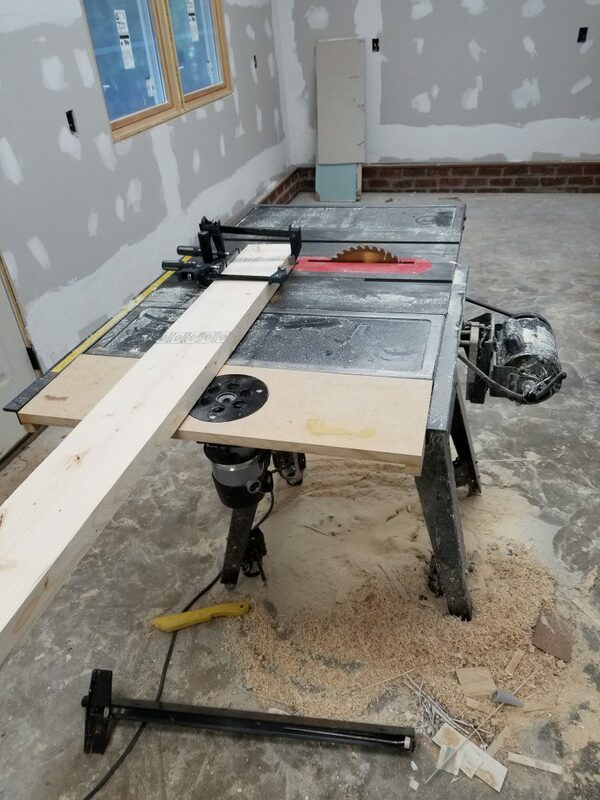 After I cleaned up the mess I connected it into the system and did another test run. 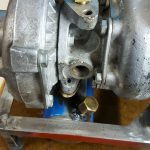 The extra resistance of the oil passing through the turbo bearings caused the pump to stall out on the first attempt. 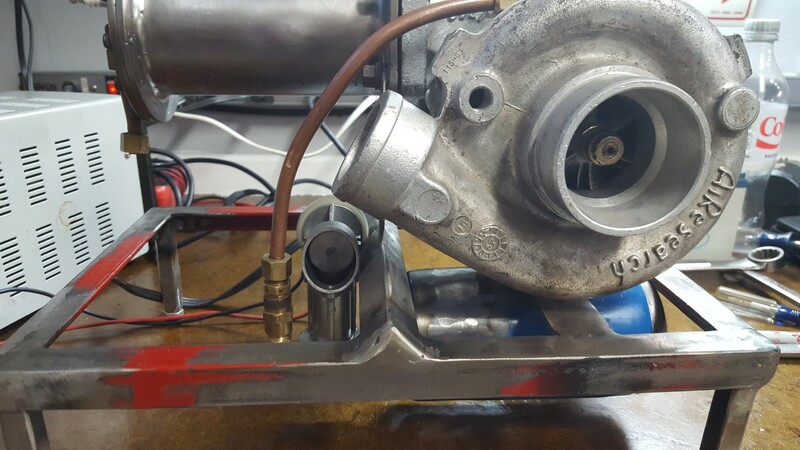 The pump was originally designed to move air, so it’s not surprising that oil was too much of a load. 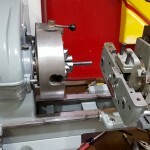 To remedy this I made a new crankshaft for the pump on the lathe with as short of a ‘throw’ for the piston as possible. 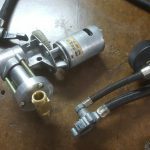 With the shorter throw, the pump is moving less oil per rev which reduces the load and prevented the motor stall. 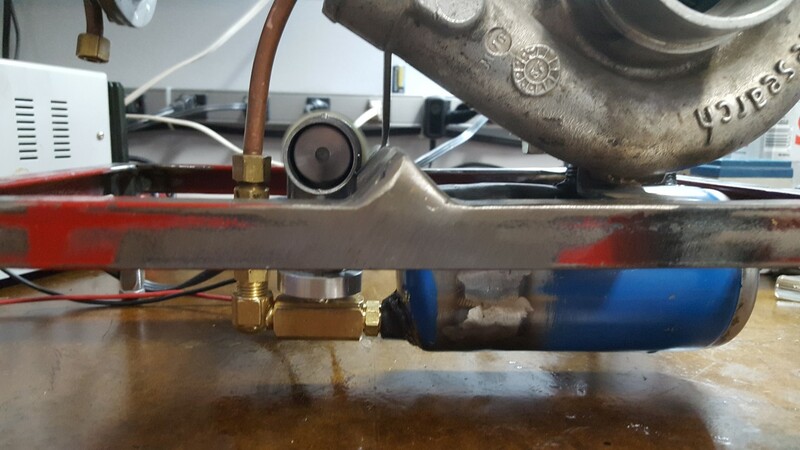 After this change it successfully ran continuously and held an average pressure in the system of about 75PSI, right about where it needs to be. 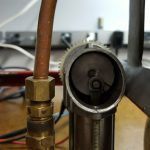 To keep things simple I don’t have a bypass or pressure regulator in the system; because of this the pressure gauge flutters with each pump stroke but this doesn’t hurt functionality. 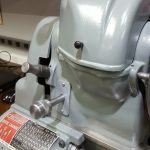 The motor draws about 5A, at 12V this is ‘only’ 60Watts and is about the same or even a bit less than when it was an inflator pump. 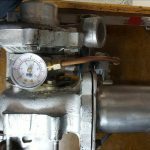 Since it will now be running for longer time periods though I need to keep an eye on the motor temperature. 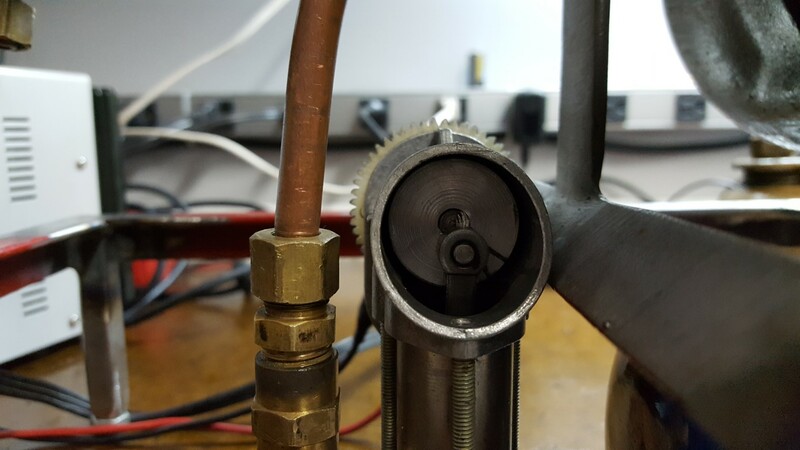 I also need to protect the plastic gear from the (eventual) heat of the combustor above. 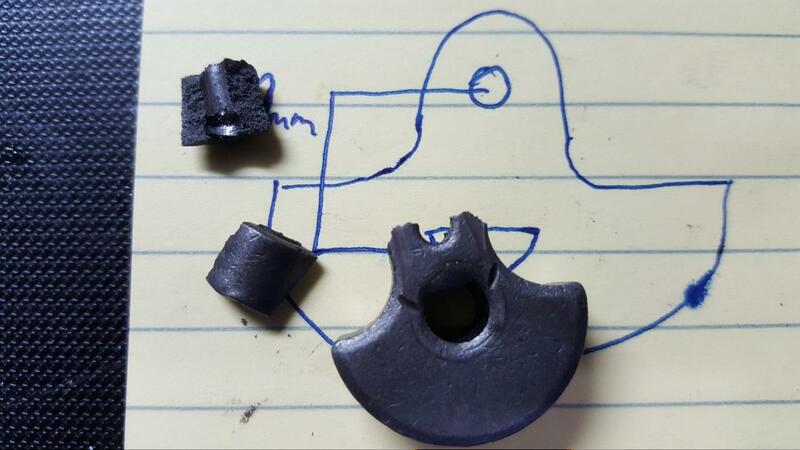 To address both of these problems I’ll likely make a heat shield for this area as well as add a cooling fan. 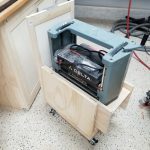 This weekend I resumed work on the jet engine project. 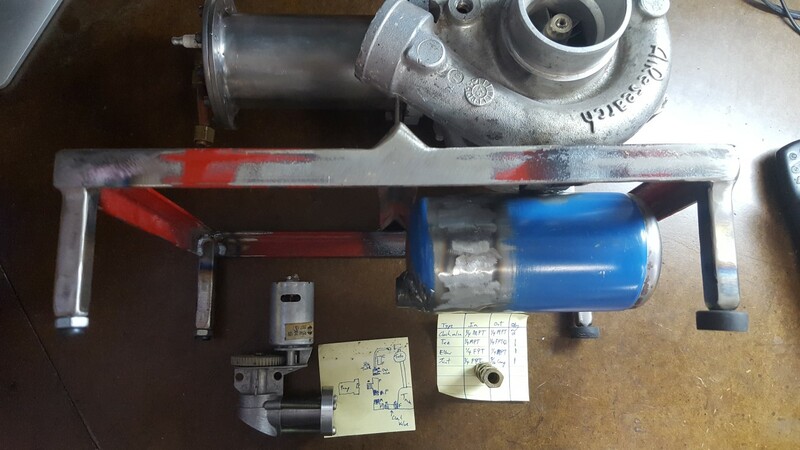 When I last left off I had just completed the frame and mounted the turbocharger/combustor. 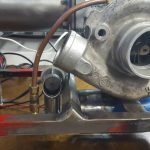 I had also fabricated an oil tank out of an old propane tank and mounted it under the turbo, but had hit a bit of a wall with what to do for an oil pump. There are electric oil pumps available, but basically all of them would be overkill for this application. Also, since this is a hobby I’d much rather put in the time to make something custom vs paying for parts. 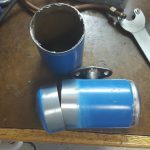 Turbocharger jet engines have been done by many others, my approach with this is to see how compact and well packaged I can make one – that doesn’t happen by bolting together a bunch of off-the-shelf parts. 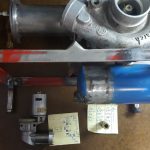 I had considered using the bus’s old oil pump, but this created more problems than it solved (connection of inlet/output pipes would be a challenge as would driving it and selecting a motor). 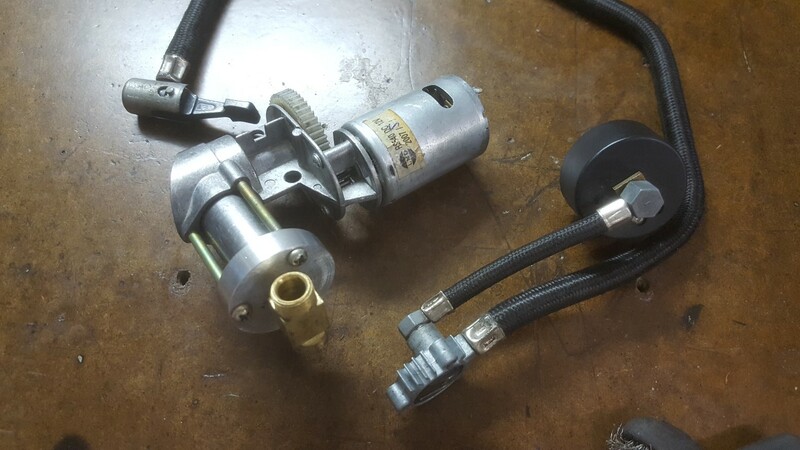 Today after a taking a fresh look at it I realized that an old 12V tire inflator pump that I had could be adapted to work. 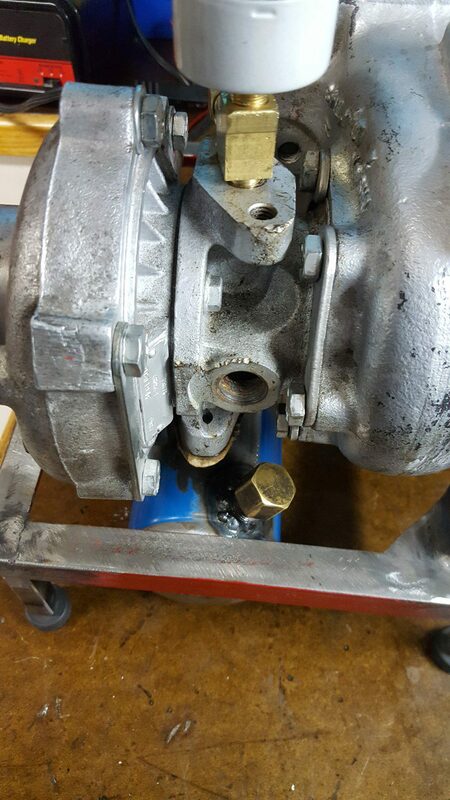 The plastic casing had broken, but the ‘guts’ were all metal and should hold up to oil pump duty. 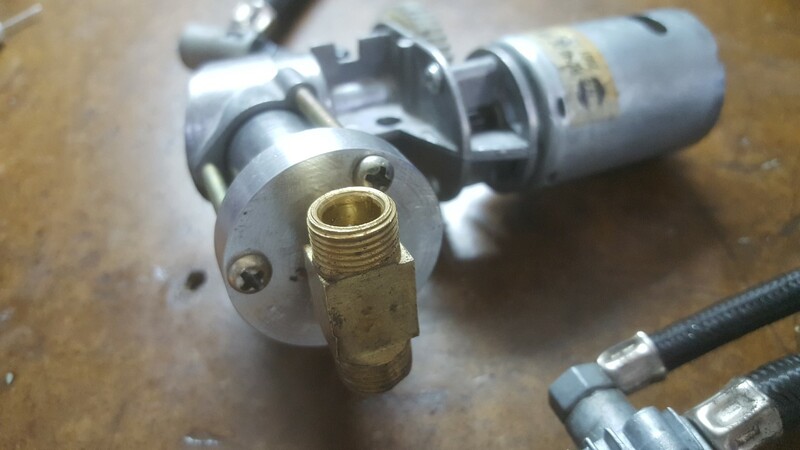 The only problem was that the cylinder head of the pump had no way of connecting an inlet pipe – being designed for air, it just drew in air from a small hole. 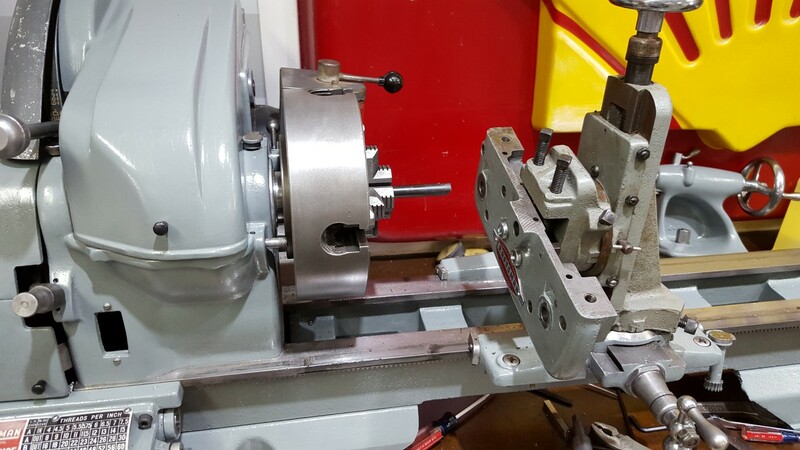 To fix this, I made a new cylinder head on the lathe with one large hole in the center. 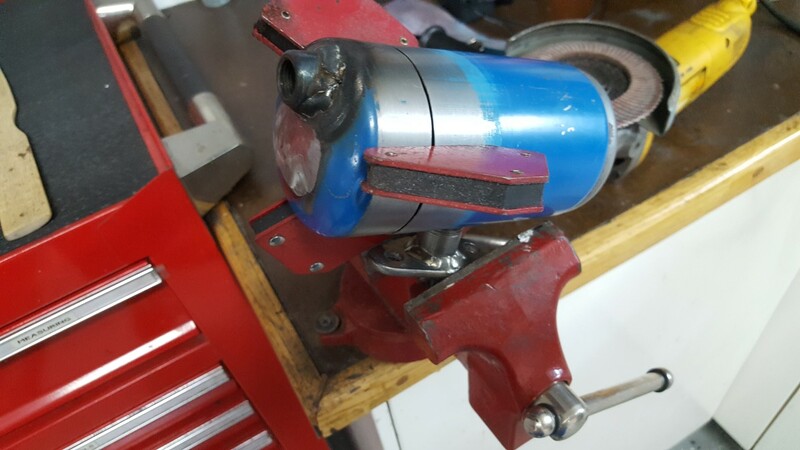 A tee fitting screws into the head and I’ll put a check valve on each side. 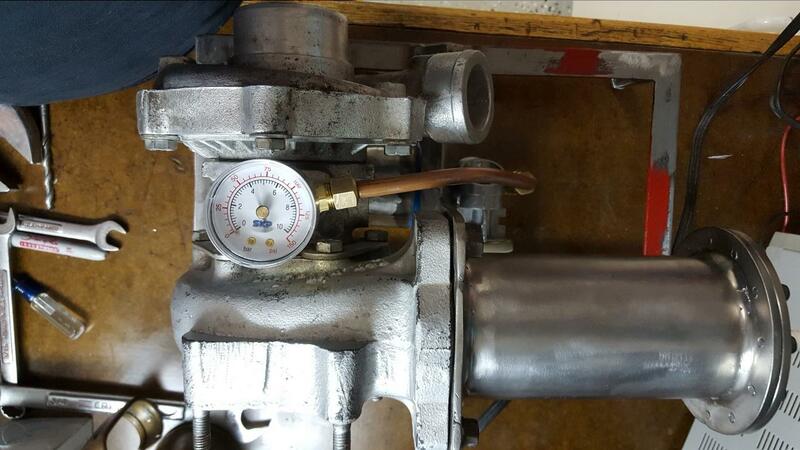 This larger single-hole head should also help compensate for the increased load of pumping oil, much thicker than air. 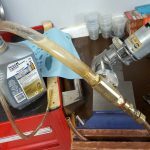 Once I start running oil through it I may have to make some tweaks to avoid overload (lower voltage, thin oil, etc) but this at least gives a path forward for experimentation. 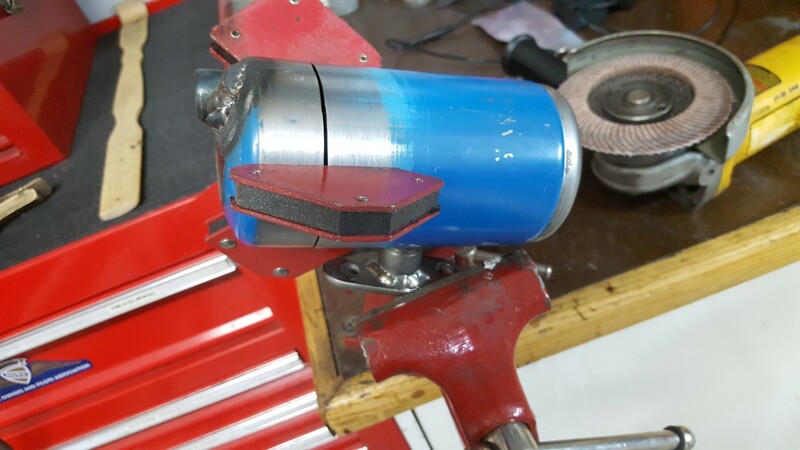 I also shortened the oil tank to make more room underneath for other support systems and made a threaded port on the lathe to weld into the tank to connect the oil pump. 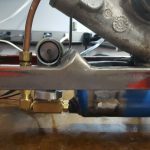 The welds aren’t the greatest looking, but are leak-free and that’s what matters – they should clean up OK after some grinding. 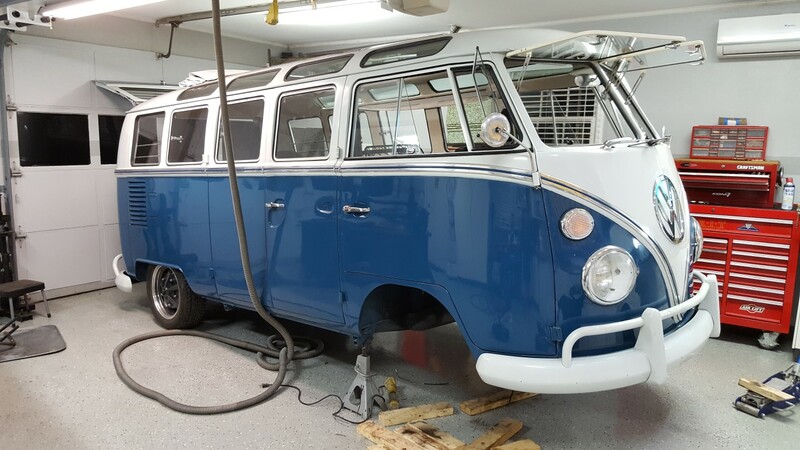 For now the whole project is in fabrication mode, but once everything is in place and working I’ll go back and do body/paint work on all the parts to make it look nice too. 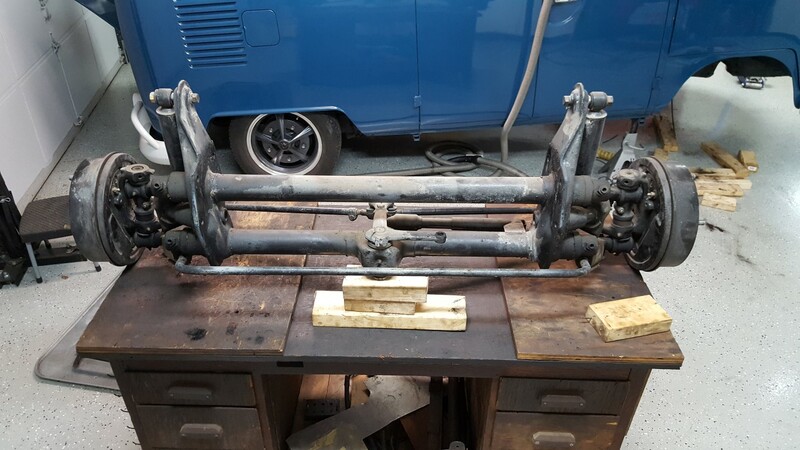 During the original bus rebuild I had ‘flipped’ the front spindles to lower it some. 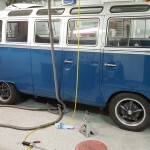 Stock height on buses was alarmingly high, lowering allowed for better handling and gave the possibility of the bus fitting in the garage with a roof rack. 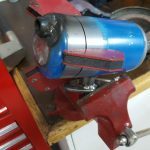 The spindle flip, however, lowers by a fixed 4-5″; just low enough that the front wheels would rub the wheel wells during bumps or heavy braking/cornering. Cornering was particularly exciting since the outside wheel would rub, slowing down that wheel with the tendency to make the turn tighter – or “positive feedback” for those of us that are into control systems (not a good thing). 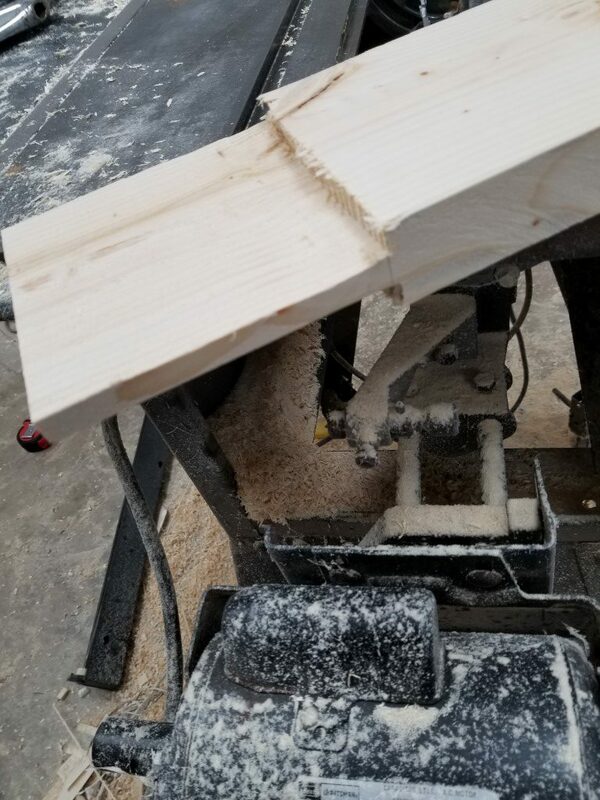 To remedy this, a way was needed to raise the front back up an inch or two. 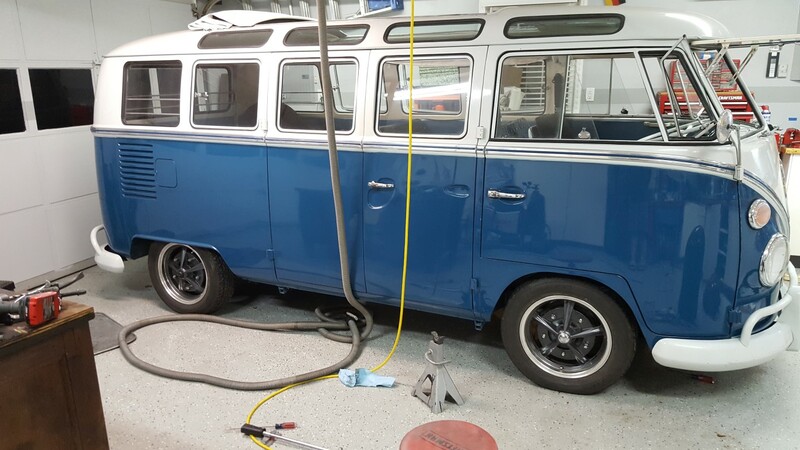 Old VW’s use a very unique front suspension design with two sets of torsion leaf springs inside of a beam with two tubes. 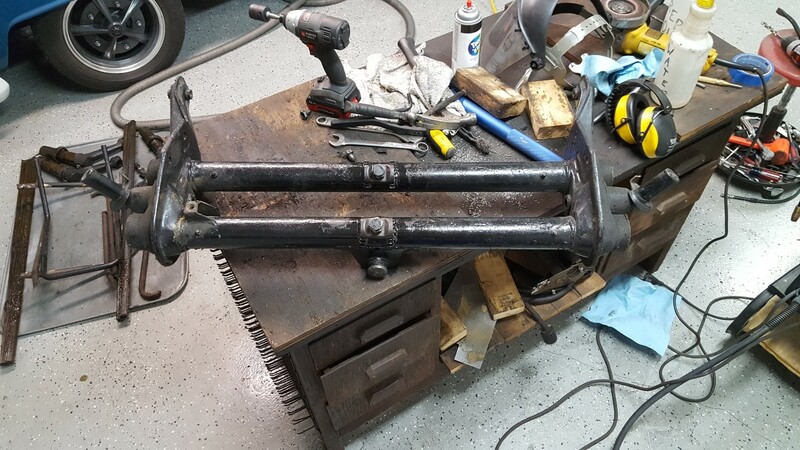 The leaf spring packs are held fixed in the center of each tube and are capped at both ends with the four trailing arms. 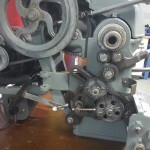 Minor raising and lowering can be accomplished by changing the angle the springs are held at the fixed center point. 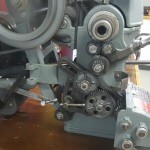 The center spring holder is held by divots crimped into the tube which engage with holes in the spring holder; these divots were drilled out which freed the holder. 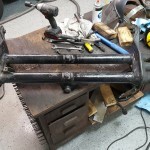 Toothed sections were then welded to the tubes; when the center is bolted in place a nut is tightened against a toothed plate that engages the teeth, holding the torsion spring pack at the new angle. Lots of things had to be disconnected and then reconnected to get the beam in/out. This made it a greasy, awkward, and tedious job but overall it went well. 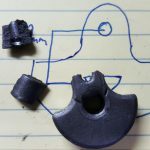 The only hiccup was that after the beam was re-installed the shift linkage interfered with the adjuster bolts, though I had read this could happen. 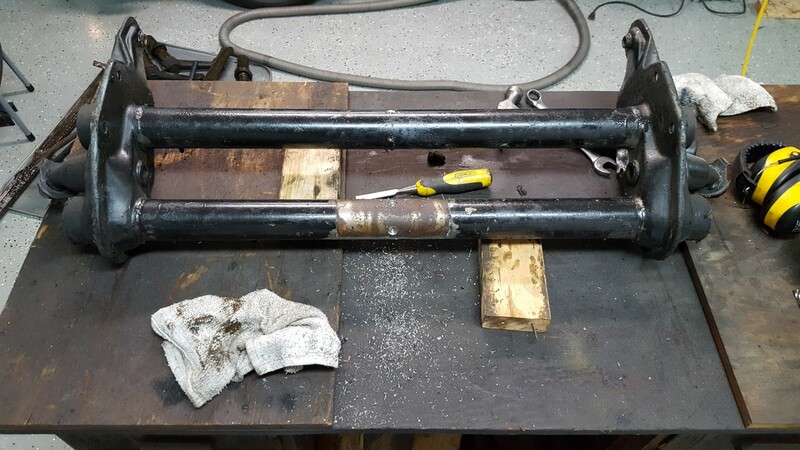 To solve this problem I welded a chunk of plate steel to the bottom of the linkage to hold the geometry and then ground out a strategic section of the linkage tube. 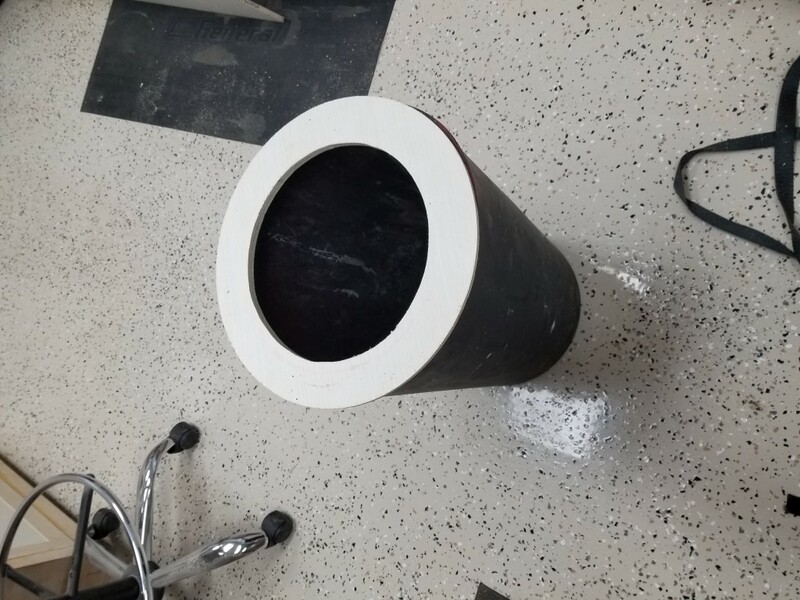 The plate is as strong or stronger than the tube, and it’s in just the right spot to clear everything above/below it. 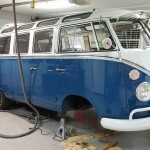 After everything was back together the bus is level and no longer rubs the front wheels! 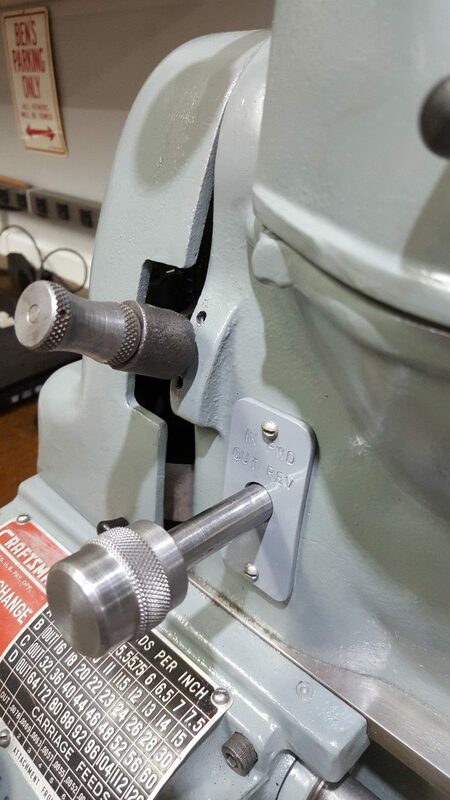 Tonight I finished up the lathe reversing switch linkage by stamping and painting the cover plate and making a knurled knob that roughly matches the others on the lathe. 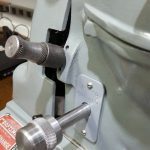 The lathe allowed the inside diameter of the knob to be bored precisely enough to get a good interference fit on the shaft – no need for any fasteners. 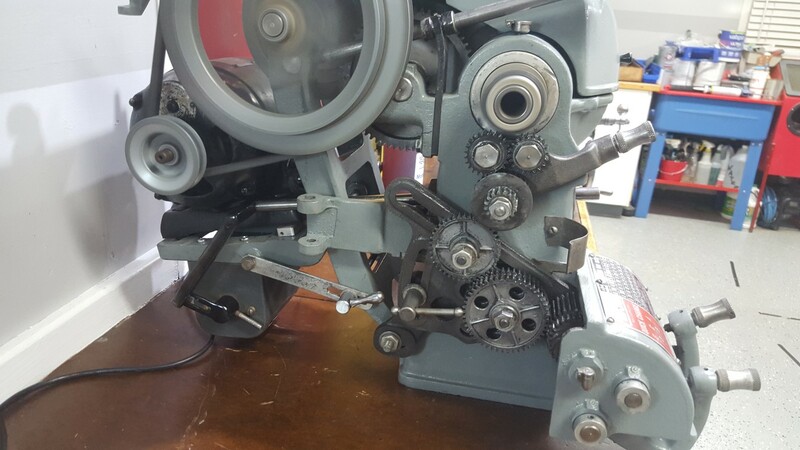 Originally the Atlas/Craftsman lathes spun in only one direction; because of this they came with only an On/Off switch integrated into the lathe’s headstock. 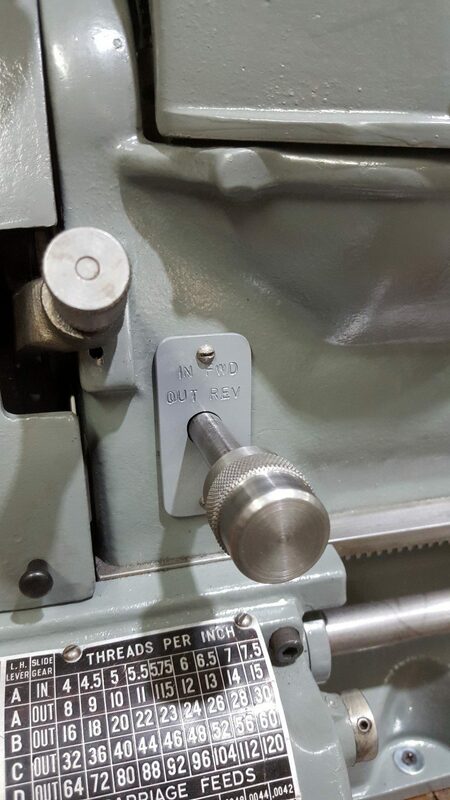 At some point in my lathe’s past the On/Off switch was removed and a reversing ‘drum switch’ added. 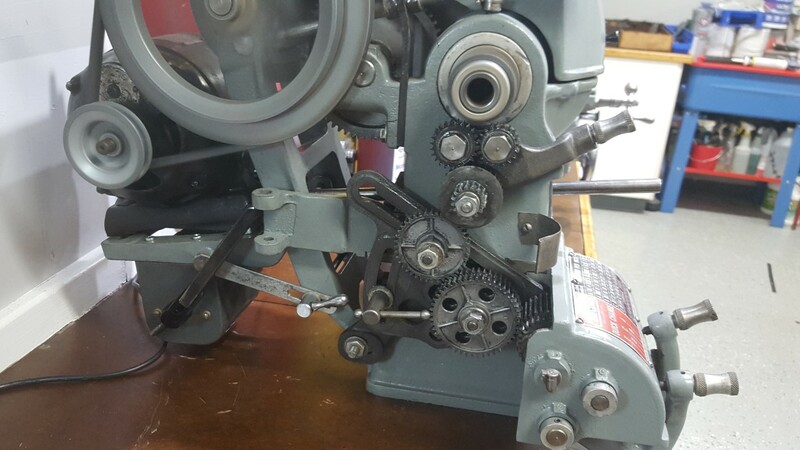 The drum switch gives the flexibility to spin either directions for special uses (cutting metric threads, power tapping, etc) however it’s it’s too big to fit in the lathe’s headstock. 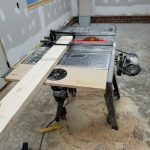 The previous owner had the switch mounted on a wooden arm extending up from the lathe’s workbench; re-using this idea would work but since I’ve moved the lathe to the shop countertop the arm would need to be rebuilt and I also don’t like the aesthetics or the need to reach over the spinning work to turn it on/off. 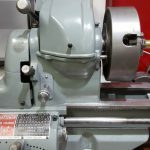 Another option would have been to mount the switch under the lathe base, however for the carriage to clear the switch would require raising the lathe – it was already at a good working height and raising would effect stability/rigidity as well as being susceptible to dripping oil. 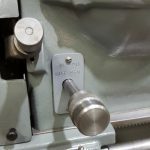 Lastly, it could have been mounted just anywhere on the ‘outside’ of the lathe (on a guard door, past the tailstock, etc) – none of these locations seemed great and overall this just seemed like giving up. 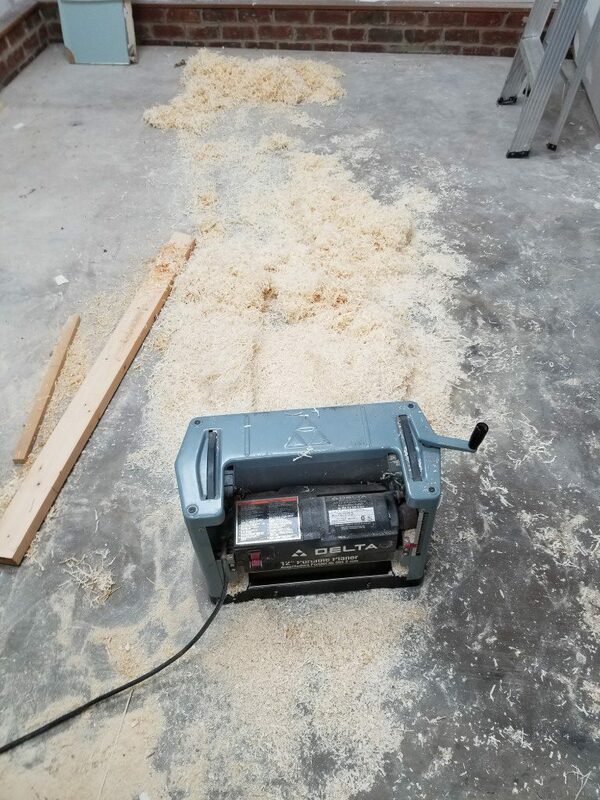 So what I ended up doing over the past few nights was locating the switch in the only volume of space just big enough for it, under the motor. 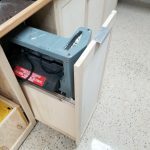 This location has the added benefit of making the wiring short and simple. As-is, this is of course very inconvenient, but I chose it with creating a linkage in mind. 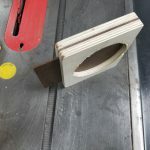 The addition of the linkage allows the original On/Off switch hole to be utilized (previously this was just an open hole), puts the control in a convenient place, and makes it look like it was designed this way. 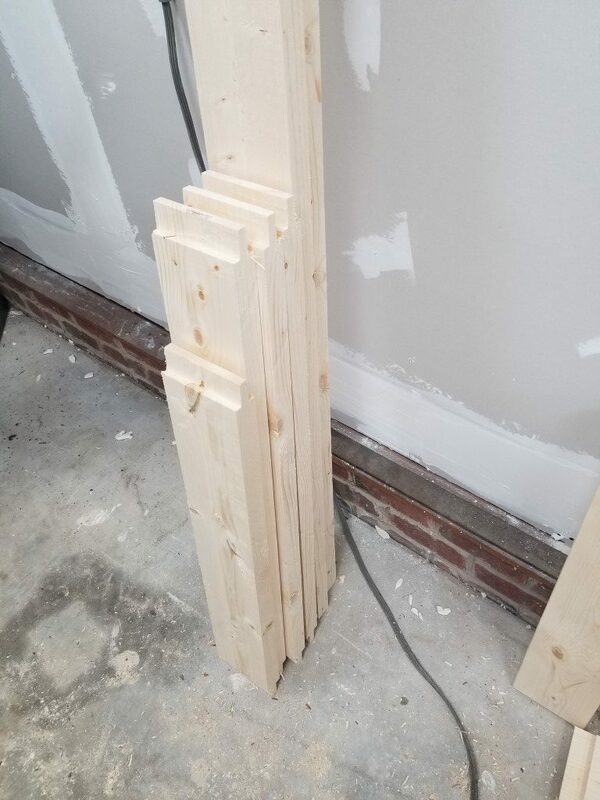 The linkage was a challenge and took a few iterations to get right. 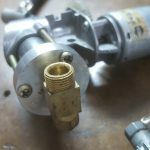 It consists of a 1/2″ OD steel tube that runs through the headstock, supported by two metal plates I fabricated. 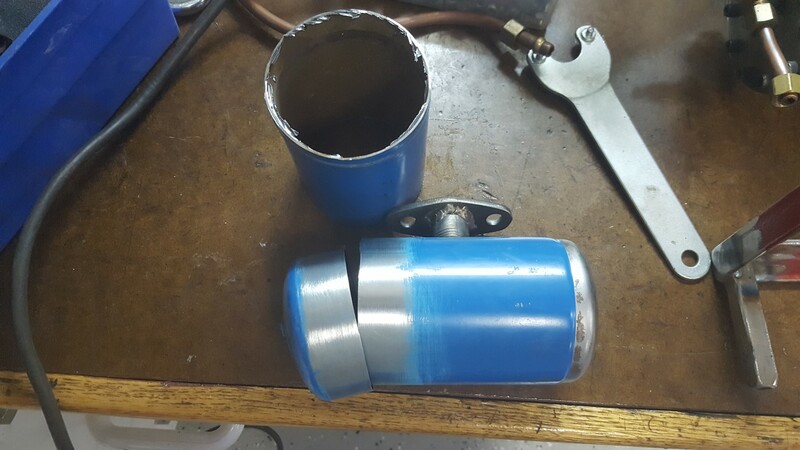 At the end of the tube I welded on a nut to accept a bolt that bolts on another arm I fabricated. 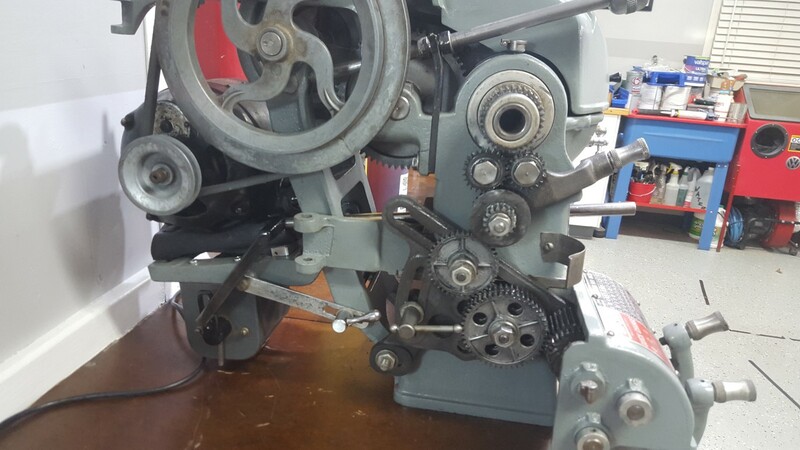 The arm has a bolt welded through it that engages with a slotted lever welded to the drum switch’s lever. 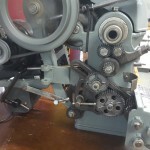 The resulting contraption actually works very smoothly: pushing IN runs the spindle forward, pulling OUT runs it reverse, and returning to center is Off. 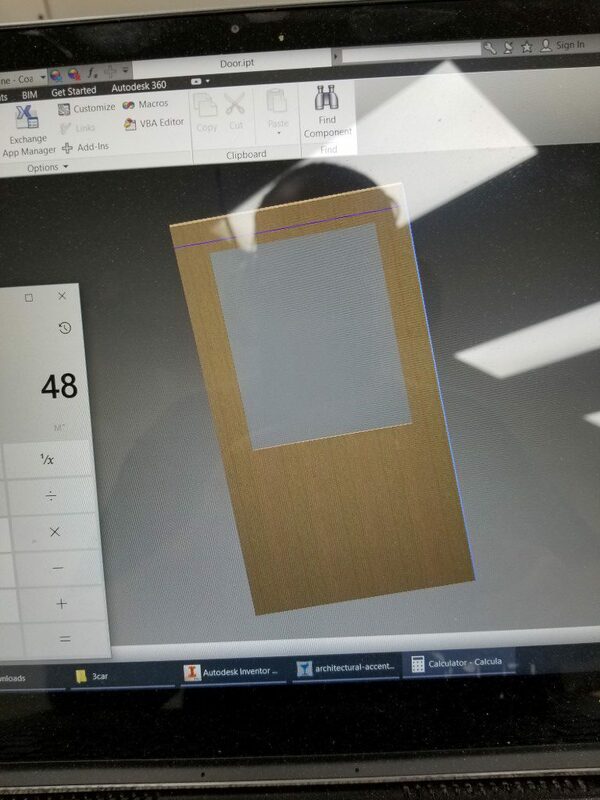 All that’s left to do is create a matching knob and mark/paint the switch plate. 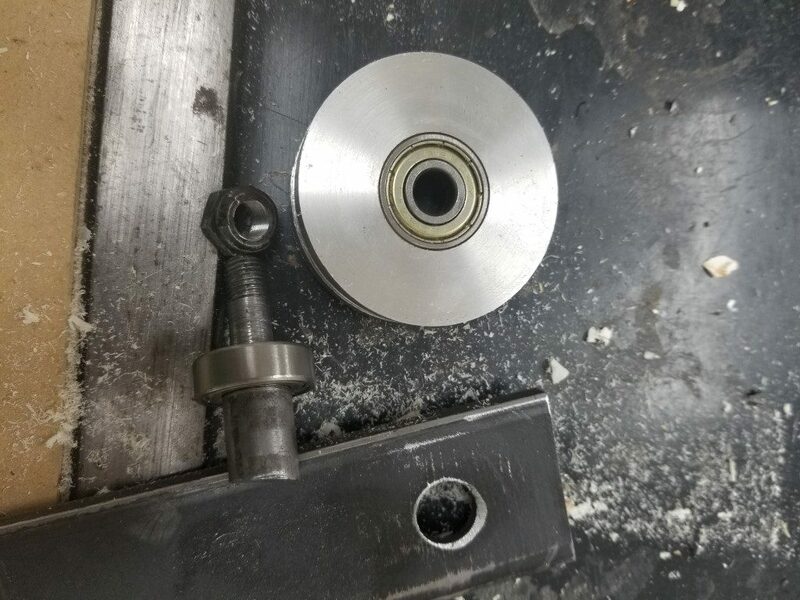 The hand wheel for the carriage (longitudinal/Z axis) of the lathe had a bit more up/down slop than I liked. 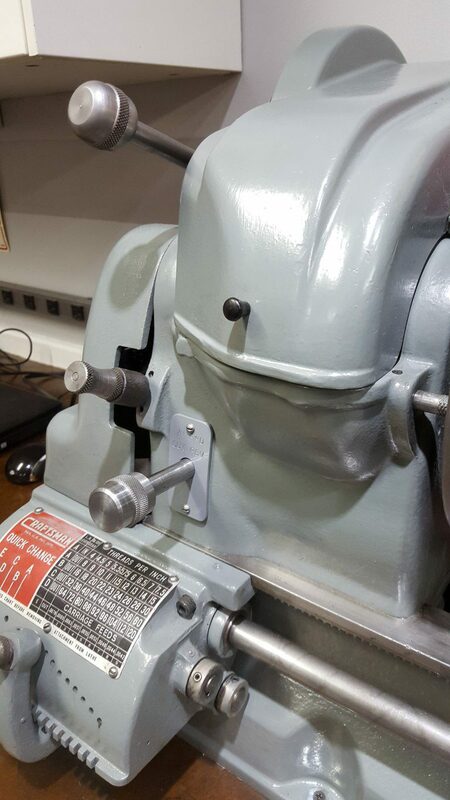 To remedy this I used the lathe to fix itself. 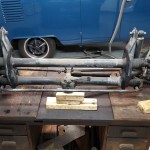 First the ‘apron’ (front plate) was removed from the carriage and mounted in the milling attachment, the smallest boring bar that came with the lathe was used to widen and true to the hand wheel hole. 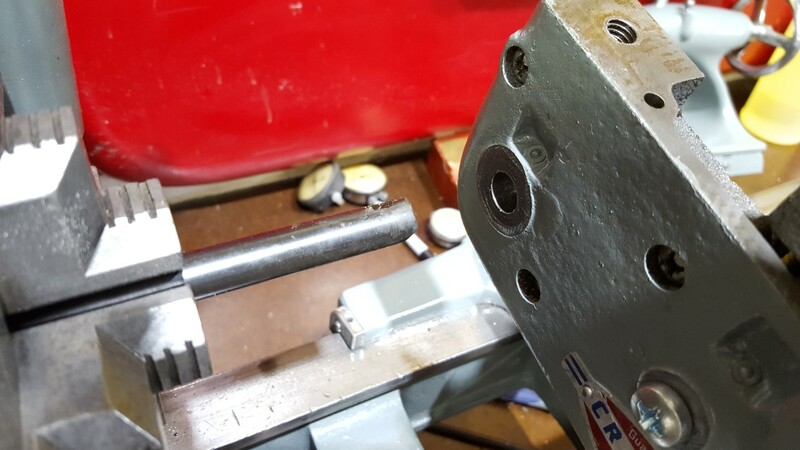 Similarly, I skimmed the surface of the hand wheel shaft to ensure it was perfectly round. 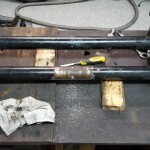 With the larger apron hole and slightly smaller shaft I was able to create and fit a brass bushing to take up the space between. 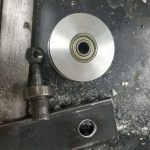 The outside diameter is a press fit into the apron and the ID has about 0.002″ of clearance to allow it to turn but without the slop previously seen. 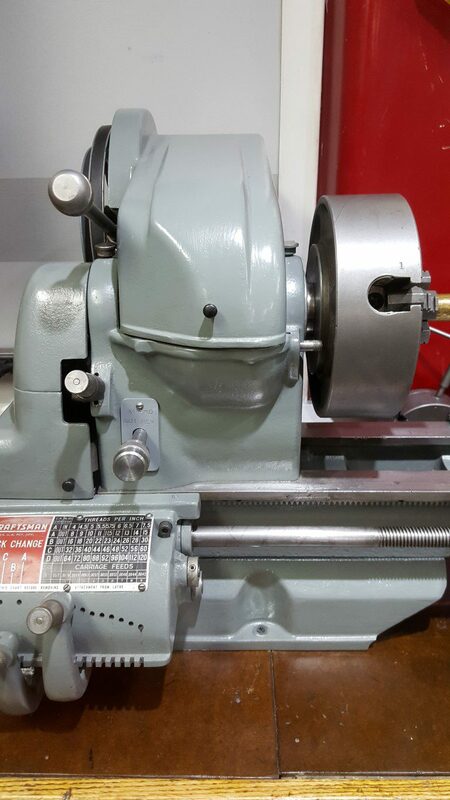 I only took pictures of the first step, I’ll take more for future lathe projects.